So what is the best psoriasis diet out there? Fact is there is no one diet that can cater to all the patients suffering from psoriasis. Different people react differently to different types of foods so it’s up to you to determine which foods are best for your particular case. Read more on some of the most talked about foods within the psoriasis community. It can be used in two ways in any diet for psoriasis: in the diet itself and applied directly on the skin. You can add one cup to your bath water or just dub it directly onto your sores. You can ingest it by the teaspoonful and if you find the taste too nasty for your taste buds you can try sweetening it with honey. For thousands of years, garlic has been used for its natural antibiotic properties and you too can take advantage of its in soups in your psoriasis treatment diet. Garlic is a lipoxygenase (it can help in stopping the activity of enzymes responsible for inflammation). They are also known as caviar or roe and they are one of the very best sources of omega-3 fatty acids. If you are new to this delicacy, try it with some crackers or simply in a dip. You may have heard about salmon’s anti-inflammatory properties elsewhere but its worth repeating. This fish is full of many good fats that help in the reduction of inflammation. It also contains carotenoid which acts as an antioxidant. To get the most benefit out of salmon, go for the wild caught instead of the farm raised kind. 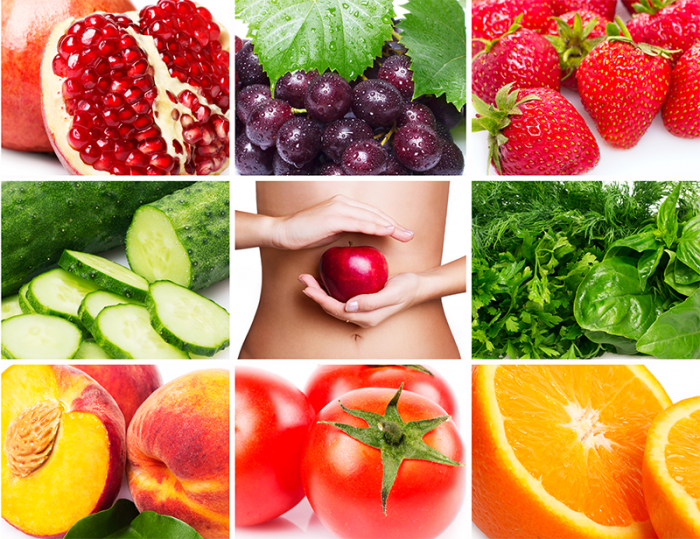 Fruits and veggies that contain vitamin A help in promoting healthy skin. Some good sources of vitamin A include mango, carrots, cantaloupe, watermelon and tomatoes. Vitamin D (also known as the sunshine vitamin) is also helpful in treating psoriasis. The good news is that you can get all the vitamin D you need from sitting in the sun for only 10 to 15 minutes daily. If eating some foods helps to reduce the effects of psoriasis then it’s only logical o conclude that other foods will exacerbate its effects. One of the common food sensitivities is to gluten (a protein found in wheat). Not eating gluten found in pastas, bread and condiments has helped some psoriasis patients to control their outbreaks. It’s only common to find natural herbs in the list of the best diet for psoriasis. Some people suffering from psoriasis have found that they respond well to herbs used to enhance the body’s immune system and reduce inflammation. While there is no scientific evidence to support this, there have been notable successes with the use of milk thistle, evening primrose oil and oregano oil. Turmeric is another herb that has been used by many psoriasis patients. Research has shown that omega-3 fatty acids (the essential fatty acids found in certain types of fish) do help reduce inflammation. In addition, the American Heart Association recommends eating fatty fish like salmon, albacore tuna, lake trout, herring and mackerel at least two times each week to protect against heart disease. Since people with psoriasis are more at risk, it makes sense to include anti-inflammatory omega-3s in their diet. However, no scientific studies have found a benefit from fish oil for psoriasis. People suffering from psoriasis should eat foods that are rich in antioxidants. Some good sources of these antioxidants include; vegetables, fruits, nuts, and whole grains. Again the main benefits of eating antioxidant rich foods is not necessarily for making the psoriasis any better, they are important in protecting against heart disease and cancer, which people suffering from psoriasis are at higher risk for. Vegetables found in the nightshade family like tomatoes, peppers, potatoes and eggplant may have an adverse effect on people who are sensitive to alkaloid substances. Alkaloids affect the muscles and nerves and thus reducing the intake of these vegetables in your diet for psoriasis can help reduce the symptoms of psoriatic arthritis if you have sensitivity to them. Psoriasis is a disease that involves a lot of inflammation so it only makes sense that an anti-inflammatory diet can help reduce this symptom. One food group that is associated with inflammation is high fat dairy. Cut out the full fat cheeses and whole milk from your diet and opt for low fat versions. Even if you don’t see any improvement, low fat dairy is better for your heart and since people with psoriasis are at high risk of contracting heart disease it doesn’t hurt. These are certainly not included in any psoriasis treatment diet. Just like dairy, fatty red meats can cause inflammation and some people with psoriasis find sticking to an anti-inflammatory diet helps with their symptoms. While these fatty red meats may not necessarily worsen the psoriasis, a heavy diet on them can promote heart disease. This isn’t good since people with psoriasis have a high risk of heart and cardiovascular diseases. When you want to eat beef, go for the leaner cuts. Alcohol is definitely not on the list of best diet for psoriasis as people do claim it makes their psoriasis worse. While there is no scientific evidence to prove this, you can explore whether limiting your alcohol consumption will reduces flare-ups for you. The main theory is that alcohol dilates blood cells and thus gives white blood cells and other substances in the blood easier access to the skin. This promotes the inflammatory response that triggers psoriasis flares. Alcohol also dehydrates the body and dries the skin worsening psoriasis symptoms. One of the worst things you can do is fall for a fad or extreme psoriasis diet promising miracles in days. These diets can rob you of essential nutrients which will in turn aggravate your psoriasis. The best diet you can go for is a healthy one and this type of diet doesn’t promise miracles.